UFC veteran Vaughn Lee has retired from MMA after a 15 year long career. They say Easter is a time for new beginnings and after 29 fights, Vaughn Lee will be getting a new lease of life. Lee (14-14-1), hung up the 4-oz. 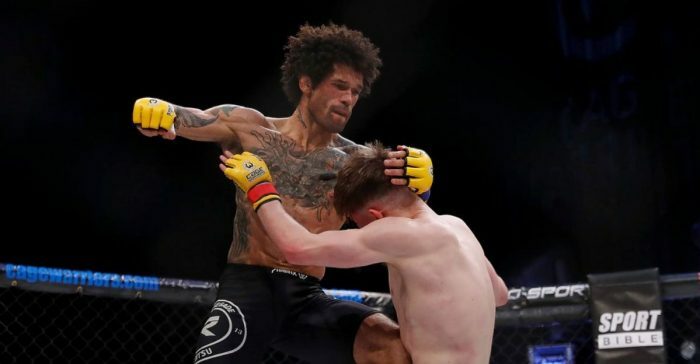 gloves last weekend after suffering a unanimous decision loss to Welshman Jack Shore at Cage Warriors 92. This was the 35-year-old’s fourth loss in a row and with his better days obviously behind him, the man from Birmingham took to his Instagram account to inform his fans of his retirement. I’d like to congratulate @jackshoremma and his team on his performance and a great show of showmanship leading up to the fight and after. We fought 3 hard rounds but it was clear that the younger hungry fighting had the edge on me. It’s very sad to say but the dream I once lived as a competitive martial artist/fighter has come to an end. I can no longer compete with the best of them as age and the accumulation of injuries forbid me to perform as I once could, but this is the reality of a fighter. We sacrifice so much and sometimes wonder if it was all worth it but when I look back I can honestly say that I lived the dream. I’d like to thank @breesemma, @chiukwongman and everyone at @renegadejiujitsu for the training and coaching, everyone at @teamfearlessmma @kamby_fearless Coach Daz and everyone at @frazersboxingclub. Thank you to @jonny_velocity for the hours you put in.Thank you to @boydfosterclarke and @phukettopteam for the training and hospitality whilst in Thailand. Thank you to Paul Kelly at @martialartconcepts for pouring your knowledge into me and showing me the way. Thank you to @jonjitsu_tatakai for helping to set me on this path as a youngster. Thank you to @mark_deville who did so much for me I can never repay. Thank you to Joe Cummins for being there on the journey and putting in the hours with and for me. The people I started with, I may not have finished with but I still hold dear to my heart, without you none of this would have been possible.I’d like to thank and also apologise to my dear wife @camcamtran for putting up with me and helping me through my depression. I will now concentrate on travelling, coaching and spending time with my family. Lee leaves the sport an 8 fight veteran of the UFC and having fought in no fewer than countries including England, Japan, USA and Russia. His win over Nam Phan in China back in March 2014 will likely go down as one of his fondest memories, but rest assured, with names like TJ Dillashaw, Iuri Alcantara and prospects like Nathaniel Wood and Jack Shore on his record, it’s likely we will be talking about him and his fighting career for many more years to come. On this Easter weekend, let’s raise a glass to Vaughn Lee to thank him for his contributions to UK MMA and wish him all the best in the next chapter of his life.